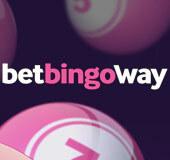 Betway Bingo Review | Claim Your £50 FREE Bonus Cash Here! Betway Bingo, or Bet Bingo Way, is one of the top online UK bingo sites for 2016. 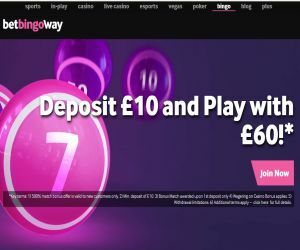 The brand is part of the larger Betway Gaming network which features the likes of Bingo on the Box and Dream Bingo. The site first launched in 2014 after lots of anticipation surrounding its release, and has fast become one of the most popular brands around. Betway has been featured on TV, and recently unveiled a new sleek layout and brand new bingo rooms. The site offers a cutting-edge online bingo experience, with great rewards and thrilling bingo and slots entertainment! There's loads up for grabs at Betway Bingo, including cash prizes, great giveaways and more! When you click on the exclusive Lord Bingo link, and sign up you will get a FREE £50 bonus after you deposit your first tenner to play with £60! Once you're signed up and ready to go with your welcome bonus you'll get access to the full selection of eye-popping promos. There are tons of Free Bingo gaming opportunities every day. The Let 'em Roll room is the best place to enjoy free bingo games every day 24/7. You can claim up to £200,000 Monthly Jackpots on Bingo as well. The site also gives out Betway Plus Points as you play and the more Plus Points that you can accumulate the larger the potential rewards will be. Watch this space for the latest exclusive Coupon Codes. At Betway Bingo, you can play both 75 and 90 ball bingo. Some of the hottest new bingo rooms include Friendship, Sapphire, Harmony, Speed, Sunshine and the Newbie room. You can also enjoy some of the trendiest casino games, like blackjack, roulette and 5 & 3 reel slots. A couple of the top games available include Thunderstruck II and Gold Factory Slots. When it comes to bingo games there are loads of massive progressive jackpots. There's also plenty of cash to be won in instant win scratch cards as well. There are so many games to choose from – you'll be entertained and winning big day after day! The site offers a great Live chat, email and phone service. If you need any assistance, you can always contact support 24/7. You can play on Betway Bingo directly via their fully responsive mobile site that works seamlessly on iphones, androids and tablets. Simply go to the main site on your mobile device and the mobile version will automatically load. When you join you’ll get a free £30 Welcome Bonus after you deposit your first tenner. You can access the site site and enjoy seamless gameplay with Apple iPhone, iPad, Android Phone and Tablet devices. Betway Bingo let’s you choose from a wonderful variety of 75-ball and 90-ball bingo games. There’s also an amazing selection of instant games including casino classics like roulette and blackjack and incredible slots like Gold Factory and Thunderstruck II. There are loads of giveaways and prizes and a Plus Points system that rewards you for being an avid player. All in all, Betway Bingo has a fabulous mobile site that Lord Bingo highly recommends. If you love Betway Bingo, you might like to try some other top brands on the Betway Gaming Network. Dream Bingo is a great site filled with dreamy games and enticing rewards. You can then join the host with the most, Bob at Bingo on the Box, for an entertaining selection of bingo, slots and casino games, plus plenty of exciting perks! 4. Grab your Bonus Bucks! Harvest The Best Of Casino Experiences At Cherry Wins! Meet The Deluxe Casino Site Presented In Fine Style – Golden Ace Casino!